These lands have the flavour of the Gospel. 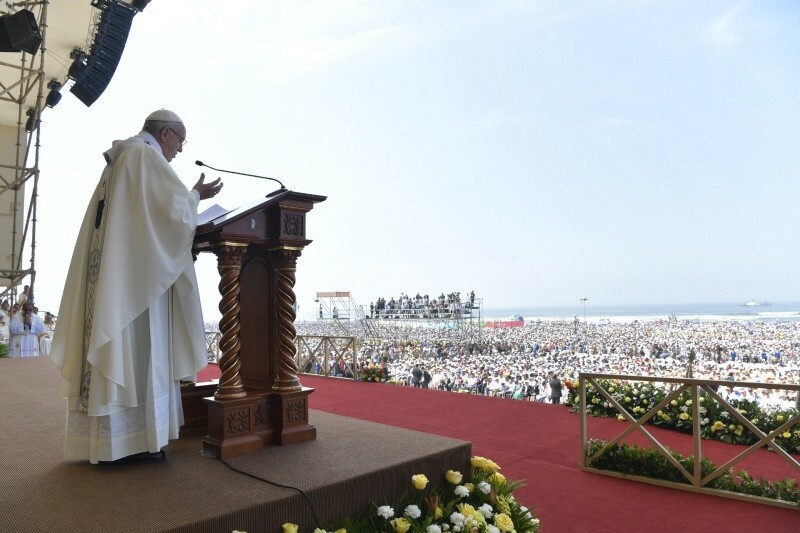 Everything around us, against the backdrop of this immense sea, helps us better to understand the experience that the apostles had with Jesus and that today we too are invited to relive. I am happy to know that you have come from different parts of northern Peru to celebrate this joy of the Gospel. Those disciples, like so many of you today, made their living from fishing. They went out in boats, just like some of you who continue to go out in your caballitos de totora (traditional reed boats), for the same reason that you do: to earn your daily bread. Much of our daily fatigue has to do with just this: trying to support our families and to provide them with what will help them to build a better future. This “lake of golden fish”, as you call it, has been a source of life and blessing for many generations. It has nurtured dreams and hopes over the years. Like the apostles, you know the power of nature, you have experienced its force. Just as the apostles faced the storm on the sea, you had to face the brunt of the “Niño costero” whose painful consequences are still present in so many families, especially those who are not yet able to rebuild their homes. This is also why I wanted to be here and to pray with you. We also bring to this Eucharistic celebration that difficult moment that questions our faith and often causes it to waver. We want to unite ourselves to Jesus. He knows our pain and our trials; he endured the greatest of sufferings in order to accompany us in our own trials. The crucified Jesus wants to be close to us in every painful situation, to give us a hand and to help lift us up. Because he entered into our history, he wanted to share in our journey and touch our wounds. Ours is a God who is not unfamiliar with what we feel and suffer; on the contrary, in the midst of our pain, he stretches out his hand to us. These times of being “buffeted” call into question and challenge our strength of spirit and our deepest convictions. They make us realize how important it is to stand united, not alone, and to be filled with that unity which is a fruit of the Holy Spirit. What happened to the virgins in the Gospel passage that we just listened to? Suddenly they heard a loud cry that woke them up and made them scurry. Some of them realized that they did not have sufficient oil to make their way in the darkness, while others filled their lamps and could see and follow the path that led to the bridegroom. At the appointed time, each of them showed what they had filled their life with. The same thing happens to us. There are times when we realize what we have filled our lives with. How important it is to fill our lives with the oil that lets us light our lamps in situations of darkness and to find the paths to move forward! I know that, in the time of darkness, when you felt the brunt of the Niño, these lands kept moving forward; you had the oil needed to go out to help one another like true brothers and sisters. You had the oil of solidarity and generosity that stirred you to action, and you went out to meet the Lord with countless concrete gestures of support. In the midst of darkness, you, together with so many others, were like living candles that lighted up the path with open hands, ready to help soothe the pain and share what you had, from your poverty, with others. In the Gospel account, we see how the virgins who did not have oil went to the town to buy some. At the crucial moment of their lives, they realized that their lamps were empty and that they lacked what was essential to find the path of authentic joy. They went off by themselves, and so they missed out on the party. There are things, as you well know, that cannot be improvised, much less be bought. The soul of a community is measured by how it manages to come together to face times of difficulty and adversity, in order to keep hope alive. By doing so, they give the greatest witness to the Gospel: “By this everyone will know that you are my disciples, if you have love for one another” (Jn 13:35). For faith opens us to a love that is concrete, practical, generous and compassionate, a love that can build and rebuild hope when it seems that all is lost. In this way, we share in God’s own work, which the apostle John describes in showing us a God who wipes the tears of his children. God carries out this divine work with the same tender love that a mother has when she dries the tears of her children. What a beautiful question the Lord will ask us: how many tears did you dry today? Other “storms” can hit these coasts, with devastating effects on the lives of the children of these lands. These storms too make us question ourselves as a community and test the strength of our spirit. Among these are organized violence, like “contract killings”, and the insecurity that they breed. Or the lack of educational and employment opportunities, especially among young people, which prevents them from building a future with dignity. Or the lack of secure housing for so many families forced to live in highly unstable areas without safe access. Or the many other situations that you have to experience, which, like terrible earthquakes, destroy the mutual trust so necessary to build a network of support and hope; earthquakes that shake the soul and require all the oil we have, if we are respond to them. We often wonder about how to face these storms, or how to help our children pull through in these situations. I want to tell you that no better way exists than that of the Gospel: it is called Jesus Christ. Fill your lives always with the Gospel. I want to encourage you to be a community that lets itself be anointed by the Lord with the oil of the Spirit. He transforms, renews and strengthens everything. In Jesus, we have the strength of the Spirit not to treat as natural the things that hurt us, that dry up our spirit and, what is worse, rob us of hope. In Jesus, we have the Spirit who keeps us united so that we can support one another and take a stand against whatever would take away all that is best in our families. In Jesus, God makes us a believing community able to sustain itself; a community that hopes and therefore struggles to reverse and transform every adversity; a community that loves, because it will not let us fold our arms. With Jesus, the soul of this town of Trujillo can continue to be called “the city of eternal spring”, because with him, everything is an opportunity for hope. I know of the love that this land has for the Virgin, and I know how devotion to Mary always sustains you and lifts you up to Jesus. Let us ask Our Lady to cover us with her mantle and always bring us to her Son. But let us do so by singing along to that lovely Andean marinera [folk dance]: “Our Lady of the Gate, grant me your blessing. Our Lady of the Gate, give us peace and much love”.